HERE ARE A FEW RULES OF THE ROAD FOR SUCCESSFULLY CONSTRUCTING AND LEADING YOUR BOARD. Boards, like any other group, perform best when they work with a leader who knows how to motivate, challenge, communicate, and set expectations to achieve objectives. Superlative leadership skills, however, are rarely a gift; usually they are honed by years of experience and a few hard knocks. 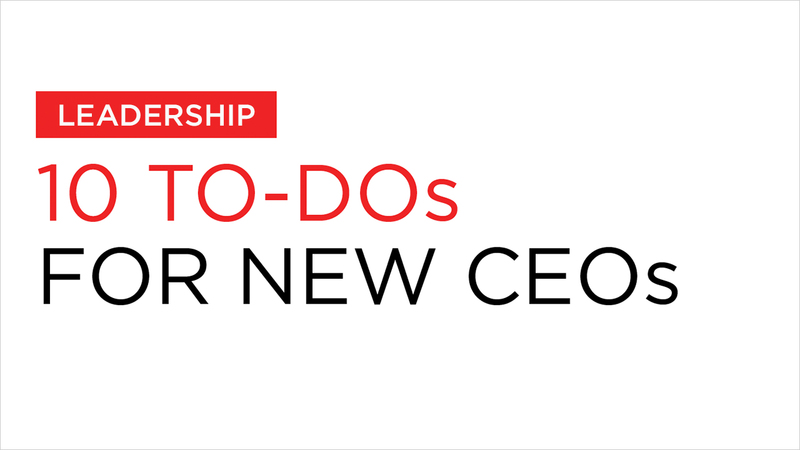 For a new CEO, there are several to-dos that, based on my years of serving as a corporate director, I’d recommend putting into place. Here are 10 recommendations for achieving an effective tone and governance leadership structure with your board. Set the tone for communication. To maximize your board’s effectiveness, you must set the right tone as CEO. First, you will be well served if you make it a part of your standard cadence to telephone each board member a week or so before the board meeting. These calls don’t have to go too deep–they can be brief, 10-minute calls just to see what issues or topics are on their minds. This way, if a board member has a big concern, you have the opportunity to diffuse it rather than be ambushed in the meeting.Communication to the board about your agenda is equally important. One idea I have seen work well is to consider writing a brief letter to the board a few days before the meeting. This helps focus the board on the key points. Another best practice I’ve seen is when a CEO starts each board meeting with a mini, “state of the union” soliloquy. This reinforces your role as CEO and leader and focuses everyone on the key topics of the board meeting, most of which you’ve also already prepared them for in your pre-meeting calls or letter. Maintain productive focus. Remember, the board eats what you serve them. Specifically, when you don’t identify a topic you are seeking input or guidance on, then the board will often jump in and take the discussion down less productive avenues. Boards are made up of smart, motivated people who want to make a contribution. It’s incumbent on you to lead them to the right subjects.The best way to engage your board and to get value out of their experience is to identify two or three strategic subjects where you specifically seek their input, such as a geographic expansion or a product road map decision. Finally, while it’s important to listen to all views, the CEO ought to have a management recommendation and seek the boards’ input. Understand the difference between the board’s job and management’s. The board’s role is oversight, not overstep, so just like the Hippocratic Oath, it is important for directors to remember: “Do no harm.” New board members sometimes have a learning curve on this point, so your chairman or lead independent director should help guide new board members on the correct level of engagement. You should also be watchful for signs of overstepping and share any feedback on the board’s performance with your lead director or chairman. Discuss, don’t recite. A satisfying and productive board meeting will cover two to three big strategic topics. Board book packages with last quarter’s financial performance and the forward-looking financial targets for the remainder of the year should be sent to directors at least three days prior the meeting. That way you can expect and assume your board has read and considered these materials thoughtfully.Don’t waste 25% of the board meeting reciting this information, as this will only irritate your board. Instead, be prepared to present the key financial insights on growth, costs, and profits and share your concerns and conclusions on the numbers. Choose board members wisely. Building your board is a key and crucial job, and you want to be both thoughtful and perhaps even a bit paranoid (more about that later). Your board should be a true competitive asset for your company, with standard committee oversight and competence as table stakes. Then, be forward thinking as well: You should plan for board evolution or board renewal just as you do with your direct reports.More specifically, I recommend you put into your governance principles that the role of the lead director or chairman auto-sunsets each year. A typical term for a lead/chair is often five to seven years; however, if you were to get sideways with this key board leader, you need a mechanism in place that enables you to remedy this. Regarding having a little paranoia, here is what I mean: Your longevity in the role of the CEO directly correlates to your personal engagement in selecting your directors. If you don’t ensure that within the first 18 months or so you have had a high level of involvement in selecting at least one-third of your directors, statistically your term will be less than five years. Evaluate the board’s skills matrix. Sometimes you need a technique to rotate members off the board. They might be investors or simply directors you have outgrown. It’s best to have a nonemotional method to determine a collective view of the skills, expertise, and perspectives needed for the board to be an asset for the corporation over the next five years. For example, your skills matrix might include deep domain knowledge, experience in scaling through hypergrowth, global go-to-market, M&A and post-merger integration, financial expertise, compensation experience, IT/cyber, etc. Encourage diversity of thought. When referring to diversity, people often mean diversity of gender or race, but in fact, diversity of thought is the most critical objective. Therefore, in addition to race and gender diversity, I would posit that bringing directors from different geographies, from a customer perspective, or an adjacent industry perspective enriches board discussions and constructively helps stress test logic and ideas. Be aware (and beware)— and have a succession plan. Alarmingly, 25% of CEO terminations result in replacement by a board member. In other words, there was no succession plan. What’s most disturbing is that anecdotally, after serving on some 25 public boards, I am betting maybe half of those 25% were coup d’états. Therefore, stay alert to signs that trouble is brewing and don’t invite Machiavelli into your boardroom. Ask for help—and follow through. During your board meetings, directors will often offer help with certain introductions or initiatives that involve leveraging their networks (as they should), and yet, in my experience, these offers are almost never followed up on. Additionally, often there is an important request by a director to get further information on a subject or on a question raised. Create a mechanism in your board meetings with the help of the chairman or lead director to capture these requests or you will frustrate and annoy your board and seem unresponsive. Support your board’s executive session. Executive sessions, prescribed as a best practice by ISS and the SEC, are a time when the directors meet without the CEO, led by the chairman/ lead director. In my view, every board meeting should have an executive session. During this time, the directors will typically review the board meeting that’s just concluded and candidly discuss their impressions of the CEO and leadership team, as well as the company’s performance. This part of the board meeting tends to focus on areas of opportunity, challenge, or concern, and these meetings serve to keep the directors aligned and engaged, without straying off on tangents.An effective chairman/lead director will solicit and capture views from each director, then do a roll-up summary with the board, followed by a readout to the CEO. The CEO should take notes and be sure that all the feedback is captured and identified for follow-ups so that every executive session is constructive and helpful. In conclusion, your board is there to perform its fiduciary duty as steward for the shareholders, but equally important, directors can help coach, mentor, and maximize the CEO’s effectiveness to ensure the company’s performance and growth potential for the long term. Select your board wisely and run your meetings well, and your directors will be an accelerant for your business! Betsy Atkins is president and CEO of Baja Corp., a venture capital investments firm, and has held board seats at more than 20 companies.